Improved survival from congenital heart disease has led to an increasing need for complex reoperation by reentrant sternotomy, with an attendant risk of cardiac injury and hemorrhage. Strategic options for high-risk reentry in this population are limited because of small caliber of the vessels. An 11-month-old female infant, weighing 6.2 kg presented for a routine follow-up transthoracic echocardiogram (TTE). She had a prenatal diagnosis of tetralogy of Fallot, pulmonary atresia and major aorto-pulmonary collaterals. She had undergone aorto-pulmonary window with collateral ligation (age 2 months), followed by complete intracardiac repair with ventricular septal defect closure, aorto-pulmonary window take-down, bilateral patch pulmonary arterioplasty and placement of a 9 mm conduit (aortic homograft) from right ventricle to pulmonary artery (age 8 months). TTE showed a large, abnormal echolucent structure in the anterior mediastinum with flow communication into the right ventricle to pulmonary artery conduit and mild to moderate conduit regurgitation. Cardiac magnetic resonance imaging and right heart catheterization demonstrated a pseudoaneurysm in the anterior mediastinum in direct contact with sternotomy wires that arose from the superior aspect of the right ventricular outflow tract and measured 6.3 cm × 5.3 cm × 3.0 cm [Figure 1]. There was flow communication with the conduit, with low-velocity turbulent swirling flow in the pseudoaneurysm. The patient's parent provided written informed consent for the publication of this report. The child was premedicated with syrup midazolam (0.05 mg/kg) and brought to the operating room with left femoral central venous access in place. After uneventful induction and tracheal intubation, the left femoral artery and right internal jugular vein were cannulated under ultrasound guidance. Aminocaproic acid was administered (150 mg/kg bolus prior to incision, 150 mg/kg in the bypass prime and 75 mg/kg/h infusion). Initial surgical dissection involved isolation of the innominate artery and the inferior vena cava at the suprasternal and subxyphoid aspects of the prior reentry sternotomy skin-incision to allow cannulation for bypass (using 8Fr arterial and 12Fr metal tip venous single stage cannulae [Medtronic DLP® , Minneapolis, Minnesota]). Heparin was administered and the remainder of surgical dissection was carried out with the bypass circuit primed and surface cooling initiated. 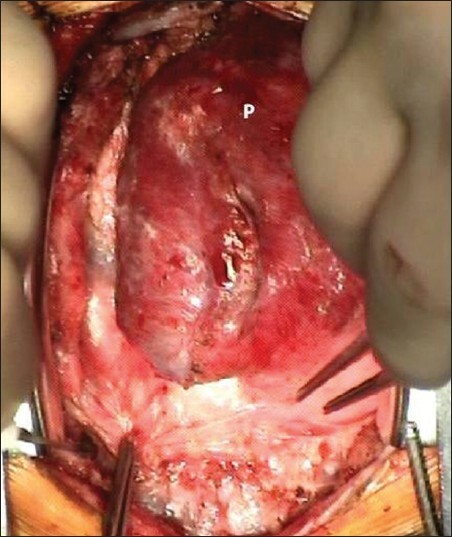 The giant pseudoaneurysm was exposed with meticulous dissection and found to occupy nearly the entire anterior mediastinum, obscuring all cardiac structures below [Figure 2]. After dissection, bypass was initiated and the pseudoaneurysm was decompressed, at which point it could be appreciated that the proximal suture line of the conduit hood was intact, but the proximal homograft tissue had disrupted to create the connection into the pseudoaneurysm. The conduit was replaced with a 15 mm aortic homograft conduit and the proximal connection to the right ventricle revised, excising the pseudoaneurysm and pseudocapsule. The patient received no more than standard amounts of allogeneic blood products (2 units of packed red blood cells and 1 unit of frozen plasma on bypass, 2 units of cryoprecipitate and 1 unit of volume-reduced platelets post-bypass). The patient was weaned from cardiopulmonary bypass on milrinone (0.5 μg/kg/min) and had an otherwise uncomplicated post-operative course. In the largest existing case series of reentry sternotomy in congenital heart disease, the principle risk factors for cardiac injury were number of prior sternotomies and the presence of a right ventricle to pulmonary artery conduit. In adults, peripheral arterial cannulation (femoral, axillary, or subclavian) has been used to initiate bypass prior to sternotomy. This technique decompresses the heart, reducing the risk and mitigating the consequences of cardiac injury on reentry. However, this strategy is not an option in neonates, infants and small children because of the small size of peripheral arteries. In our patient, the femoral arteries were approximately 3 mm in diameter. Even in a larger child with a vessel that could accommodate an adequate size cannula, this strategy carries a significant risk of limb ischemia (sometimes requiring amputation) in children. In our patient, the carotid arteries (at the level of the thyroid cartilage) were approximately 6 mm in diameter. Carotid cannulation is used in children of this size for rescue extracorporeal membrane oxygenation, but the risk of ipsilateral hemispheric stroke is tolerated given the gravity of the underlying condition. We did not believe this was an acceptable risk in our patient undergoing an elective cardiac procedure. There are two additional alternative strategies to peripheral cannulation. Repair of congenital cardiac pathology under surface cooling alone (circulatory arrest without systemic perfusion) has been described with acceptable long-term outcomes,  but in our opinion, the technique is best viewed as historical technique. We believe the best alternative is suprasternal dissection to facilitate the use of the innominate artery as the arterial inflow. A variation on this technique, end-to-side anastomosis of an expanded polytetrafluoroethylene graft to the innominate artery has been described previously. Venous return can be obtained by subxyphoid access to the inferior vena cava, or if other options prove unsatisfactory, by cardiotomy suction. Sternotomy can then be performed with the perfusion circuit established and ready to commence bypass as in this case, or preemptive initiation of bypass can be used to decompress cardiac structures even prior to sternotomy. Additionally, while managing such cases adequate venous access is needed and blood products should be available and the cardiopulmonary bypass circuit primed at the time of incision. Close communication and coordination between the surgical, anesthesia and perfusion teams is essential. 1. Kirshbom PM, Myung RJ, Simsic JM, Kramer ZB, Leong T, Kogon BE, et al. One thousand repeat sternotomies for congenital cardiac surgery: Risk factors for reentry injury. Ann Thorac Surg 2009;88:158-61. 2. Luciani N, Anselmi A, De Geest R, Martinelli L, Perisano M, Possati G. Extracorporeal circulation by peripheral cannulation before redo sternotomy: Indications and results. J Thorac Cardiovasc Surg 2008;136:572-7. 3. Sakamoto T, Asou T, Takeda Y, Date K, Nanaumi M. Long-term outcome of intracardiac repair under simple deep hypothermia. Asian Cardiovasc Thorac Ann 2006;14:458-61. 4. Knott-Craig CJ, Goldberg SP, Kirklin JK. Surgical strategy to prevent cardiac injury during reoperation in infants. J Cardiothorac Surg 2008;3:10.